If you suspect your smoke alarm is faulty or damaged, even if by accident, please urgently contact the Property Services Team on 0141 331 6652. Do not attempt to disconnect the smoke alarm at any time as you will be immediately placing yourself at increased risk in the event of a fire. The Scottish Fire and Rescue Service want to make sure your home is as safe from fire as it can be. They provide a FREE Home Fire Safety Visit, available at any mutually convenient time (day or night). Their staff can help you to spot potential fire hazards and offer advice and guidance and fit smoke alarms free of charge (if your home requires them). The visit takes around 20 minutes and that 20 minutes might just save your life. It is essential that your home has a working smoke alarm. If a fire starts, this will give you and your family time to get to safety. Fire often starts in the kitchen and no-one should ever leave a cooker unattended while it is in use. Stay in the room with any lit candles and make sure they are kept away from children and pets, and from curtains or other flammable materials. Get out only if safe to do so, stay out and call 999. Never open a door if it's warm to touch, there could be fire inside. To assist in robust fire safety across our Multi Storey & Deck Access properties, we ask for your continued vigilance and cooperation to ensure common areas are kept clear of obstructions. Please alert our Concierge Teams to any areas requiring attention. Scottish Fire & Rescue service has confirmed that in the event of a fire, residents should Stay in Place to allow controlled fire-fighting and evacuation, as deemed appropriate by them, at the time. 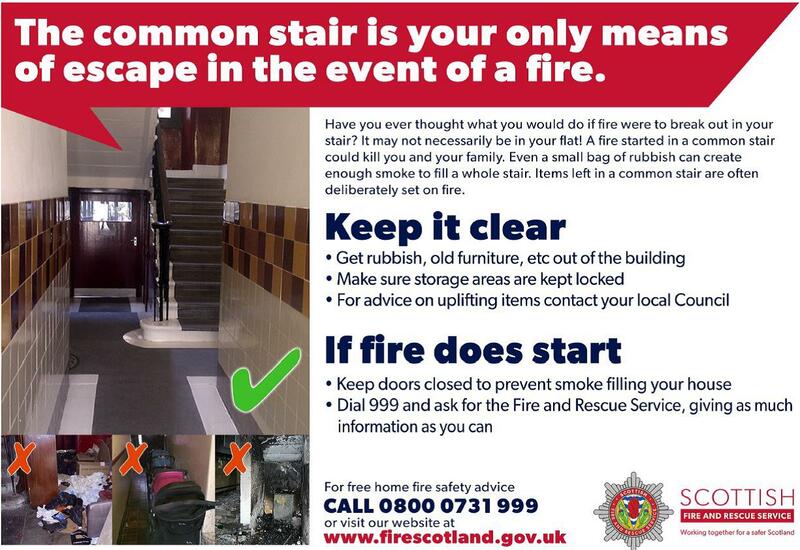 For further information from Scottish Fire & Rescue Service call 0800 0731 999 or visit www.firescotland.gov.uk.